Conditions characterized by tool complexes of related inventions to fit specific conditions of places. Material artifacts and devices that contribute solutions to the existing conditions to alter their arrangements. The associated ideas that enable the tools to function effectively among a society of users. The power of some technical inventions to reorganize our world: Five ages are identified with the underlying material of which tools were made. Technological changes have been used to divide our past into periods. Technology is a material manifestation of dominant ideas, practices and institutions with varied means and powers to solve problems that serve a human purpose. Technology influences our characterization of appropriate gender roles. Laws of Technology reveal the power of certain tools and discoveries to alter the measure of our surrounding world, experience and values: sundials, clocks, watches, computers. Technologies in the contemporary world, based on a mechanistic view of reality where machines alter our behavior "aims to remake nature and compel us to live entirely in a technical milieu." For example: automobiles, telecommunications, film, automatic rifles. Technological change has reorganized our ideas of space, time and appropriate behavior, offering humankind a great choice to either adapt and learn, or remain powerless and enslaved by our self-satisfied ignorance of nature, history and one another's needs. 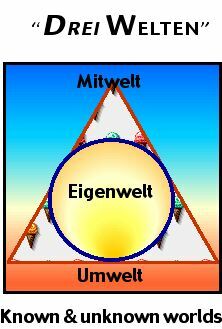 Eigenwelt is the personal world of our experiences. Mitwelt is the social world in which we participate with others. Umwelt is the universe, the cosmos, the earth to which we are tied. "We are what we use."